I first glimpsed Africa through a minute airplane window two seats and an aisle away. A irritable woman guarded the small pane of glass and matched each of my curious glances through it with pointed glares back in my direction. I didn’t care. It would take more than a few annoyed looks to diminish the excitement generated by my three-second view of rolling red hills and mist. This brief sighting marked the beginning of the plane’s descent and the end of the 16 hour flight from New York to Johannesburg. Upon landing, we gathered our things and raced to passport control. We had only an hour to make our connection, and due to the variability of the lines, we were not guaranteed success. We eventually squeezed through the crowd at passport control, jumped the line at the security checkpoint, and sprinted through the international terminal, arriving at the gate with little time to spare. In just two hours we would be in Windhoek, the capital of Namibia and the largest city I would see for nearly two months. 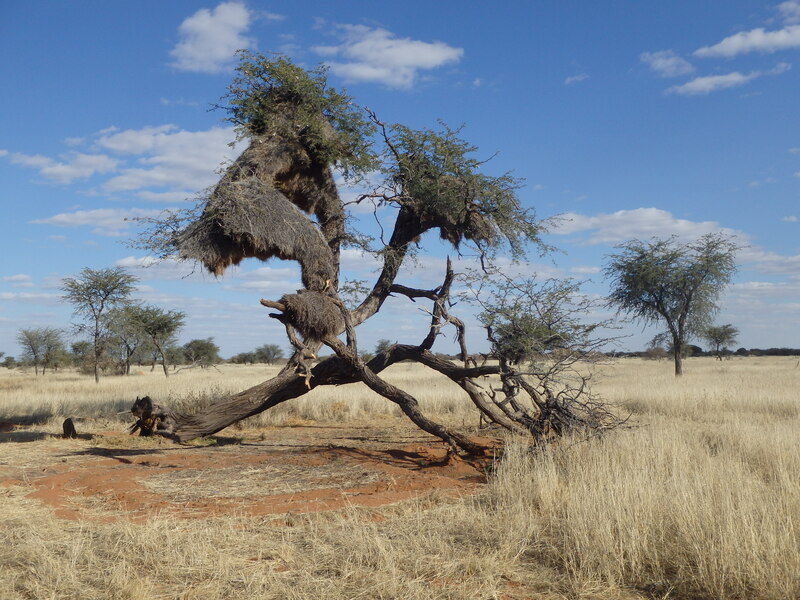 I was headed to Africa for a six-week stint as a research assistant on a project designed to determine the evolutionary back-story to the extraordinary cooperation exhibited by sociable weavers in building and maintaining their large communal nests, pictured to the right. The project, headed by a grad student from my university, focused on a hypothesis that the threat of peer punishment kept the birds contributing to the upkeep of the nest rather than solely focusing on their own personal needs. Upon arriving in Windhoek, the plan was to catch up on sleep, pick up supplies and head out the next morning to Kuzikus Wildlife Reserve, our home for the next month and a half. This is the first in a series of belated posts about my research experience in Namibia this past summer. Stay tuned for more!